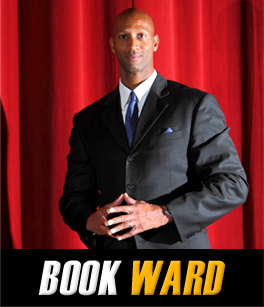 Jerod Ward has spent years motivating and inspiring people throughout his life by sharing his story on overcoming life’s adversities. As a young adult, Jerod can remember working on his basketball shooting skills until the middle of the night with his father right by his side coaching him. “Growing up my father was always there to share his knowledge and wisdom, thus he helped mold me into the man and father I am today”. All of the sleepless nights and hard work paid off, Jerod earned the high school Naismith Player of the Year award in 1994. This was just the beginning of his worldwide journey. Jerod went on to have offers at many different universities being sought after as the #1 high school basketball player in the nation. On the morning of May 5th 1994 which also happened to be his 18th birthday Jerod narrowed his decision down to the University of Michigan. Life doesn’t always begin with just success, there are always challenges you must overcome. Having to live up to his expectations and pressure as an young athlete unfortunately he was riddled with injuries. After multiple knee surgeries Jerod was not only physically but also mentally broke down. “I remember the day my doctor told me that playing basketball professionally may never be in my future”. With almost no ligament left in Jerod’s knee he was ready to give up. “My mind wouldn’t let me give up, there was too much fight left in me”. At that point Jerod had a breakthrough. It took him back to his days as a child and his father instilling in him his drive and hard work ethic. Day in and day out Jerod rehabbed nonstop, he dug deep to find his physical and mental strength. After pushing himself into his best physical shape ever Jerod was ready… Jerod went on to playing professionally for 14 years at the highest levels worldwide including the NBA. Now retired from playing basketball, Jerod still stays close to the game he loves. He has worked as a college basketball analyst with networks including ESPN, FOX Sports. Jerod lives in Sarasota, Florida with his wife Tricia and daughter Violet.